Stairs are an essential component of most landscapes, and Evergreen Landscape & Design builds amazing stairs. Landscaping with stairs is limitless in its possibilities. Some of our favorite stairs to build in Evergreen, Colorado, and the surrounding mountain communities of Golden, Conifer, Morrison and Genesee are natural stone stairs. We can build landscape stairs like mortared flagstone stairs, natural stone slab stairs, and stone stairs that incorporate large boulders around them. We use landscape timbers to build stairs when cost is a factor. Landscaping with timbers is not our first choice simply because rock lasts forever, and timbers do not. We recommend making the investment in stone stairs that will provide years of maintenance free use and will never need replacing. 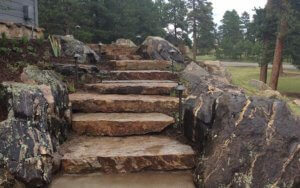 One of our most popular stairs we build in evergreen Colorado is stone slab stair climbing between boulders. We install plants in the boulders and the final look is softened and appealing to the eye. Another popular option is mortared flagstone stairs. This process involves pouring a concrete slab and then mortaring custom fitted flagstone to finish the stairs. Most often stairways will be incorporated with the other elements of an outdoor living space and will connect pathways or patios spaces. We also build stamped and stained concrete stairs. Stairs will often be constructed in between retaining walls. Stairs can be the most challenging phase of a project and we have mastered the construction techniques. Stairs in a landscape are essential in providing access but also offer a pleasing visual detail to a project. The most rewarding and pleasing landscapes are often those that have varied terrain and that require things like retaining walls and stairs. Give us a call for a free consultation and review of your home’s landscaping needs. We will be happy to show you the possibilities and we specialize in envisioning landscapes in challenging terrain.